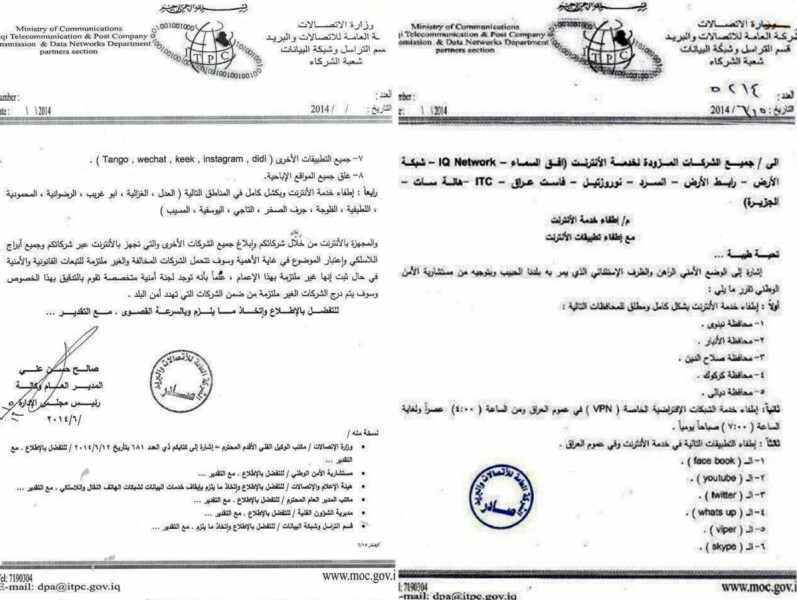 Scan of documents leaked from Iraq's telecommunications ministry. The original version of this post appeared on the Social Media Exchange blog. A leaked document from Iraq's Ministry of Telecommunications shows that the government has decided that the best solution to fight false and embarrassing online news is by doing what Mubarak did three and half years ago in Egypt, kill the Internet. Multiple local journalists and experts have confirmed the veracity of the document. In addition to being a violation of Iraqis’ rights, the action is seen as a rejection of efforts by Iraqi bloggers of the country-wide Iraqi Network for Social Media to fight false news not with censorship but with more accurate news. Search for the hashtag #INSM_iq as well as this list of trusted Twitter users from inside the country to follow developments. 1- Shut down the Internet totally on these Provinces: Ninawa, Anbar, Saleh El Din, Kirkuk, Diyalah. There will be a special security committee specialized to to check that you are following these instructions. The companies that won’t obey will be threatening the security of the country.